What is Mint Green Fluorite? Mint green fluorite is a beautiful green variety of fluorite that favors subtle splashes of blue. The name “fluorite” comes from the Latin verb for fluo, meaning “to flow.” Initially, the mineral “fluorite” was called “fluorspar.” Over the years, the fluorescence qualities of this stone lent its name to “fluorescence,” which occurs due to certain impurities found in the crystal. Is mint green fluorite valuable? The value of colored stones is typically determined by a combination of its color, clarity, cut, and carat weight. This is no different when determining what mint fluorite is worth. These guidelines will help you choose fluorite stones for your collection. Mint green fluorite displays a dainty green shade, a color range perfect for a summery appearance. The presence of chromium in the stone lends this beautiful hue to the fluorite; otherwise fluorite is colorless. It favors subtle splashes of blue, making the gem appear lively and energetic. When choosing mint green fluorite, the stone’s color is most important. Gemstones with a deep saturation of color are highly sought after and commands a higher price in today’s market. Mint green fluorite occurs in a range from transparent to opaque gems. Fluorite belongs to the Type II category of the GIA clarity grading system. Gemstones of this category contain inclusions. But due to their saturated and deep color, most of these gemstones appear eye clean when viewed without magnification. Inclusions are accepted in this colorful gemstone. But, a large amount of inclusions decreases the value of the fluorite gemstone. Also, mint green fluorite displays fluorescence under ultraviolet light (UV). While fluorite is a fragile gemstone, skilled lapidaries can shape it. Mint green fluorite is available in traditional ovals, rounds and cushions, but fancy shapes can also be found. The gemstone tends to chip owing to its softness, and thus, it must be cut cautiously. Accessibility to suitable rough makes mint green fluorite available in a variety of sizes. The gemstone is found in round shapes up to 14 mm, oval shapes up to 18 x 13mm and occasionally in sizes as big as 20mm x 15mm. 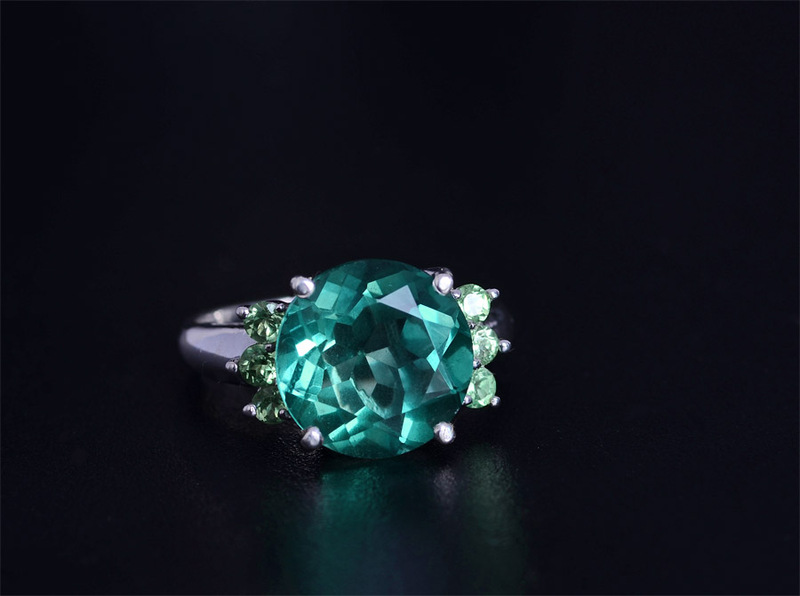 AIn addition, the value of the gemstone increases with increase in size. However, other factors such as color and clarity also play an important role in determining the price of the gemstone. Often, novice or amateur collectors might ask if fluorite is real. What’s really being asked is if mint green fluorite is treated. It is a natural gemstone that never undergoes any treatment. The gleaming intense mint color of mint green fluorite is natural, and no treatments or alterations are required to achieve it. Fluorite ranks four on the Mohs scale of hardness, making it rather less tough and durable compared to most gemstones. Caring for mint green fluorite stones is comparable to that of precious opal. Ultrasonic cleaning and commercial chemical cleaners should not be used to clean this gemstone. It is very sensitive to temperature change and therefore it should not be exposed to sudden changes of extreme heat or cold. When cleaning fluorite, use lukewarm soapy water and soft bristled brush for gently scrubbing, and a soft cloth for drying. Furthermore, the gemstone should not meet cosmetics, hairspray, perfume or household chemicals. Mint green fluorite should be stored separately from other types of gemstones or gemstone jewelry to protect them from possible scratches. Who Can Wear Mint Green Fluorite? The refreshingly cool charm of mint green fluorite is ideal for complementing summer and winter fashion. Lovers of morning dew or inspiring greens will want to add this gemstone to their personal collection. Furthermore, the elegant shade of mint green can be matched with other pastel shades like powdery pink or beige, dark turquoise or white. Despite its relative softness, it is perfect for jewelry items such as rings, pendants, earrings or brooches. 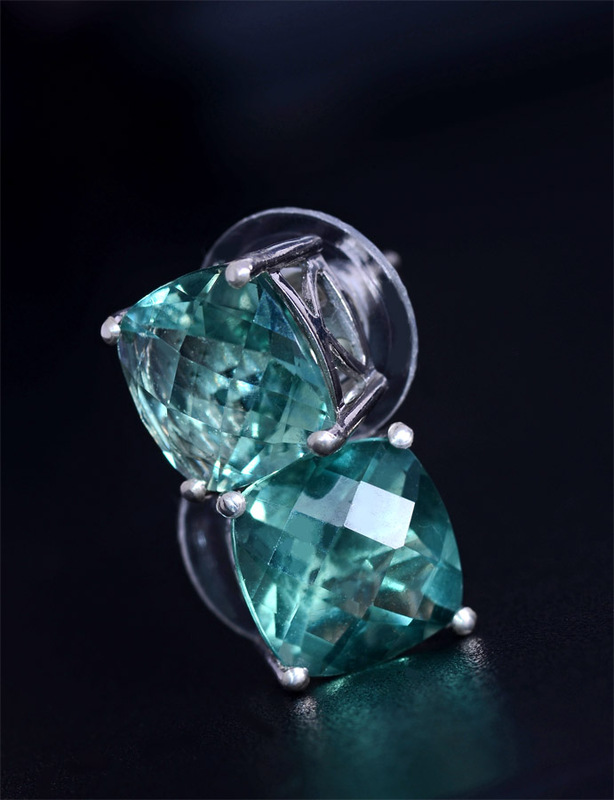 Following the intensity of the color, mint green fluorite makes the best solitaire stone! How Does Mint Green Fluorite Compare to Other Green Stones? Mint green fluorite is sometimes compared to emerald in color, and it’s easy to see why. 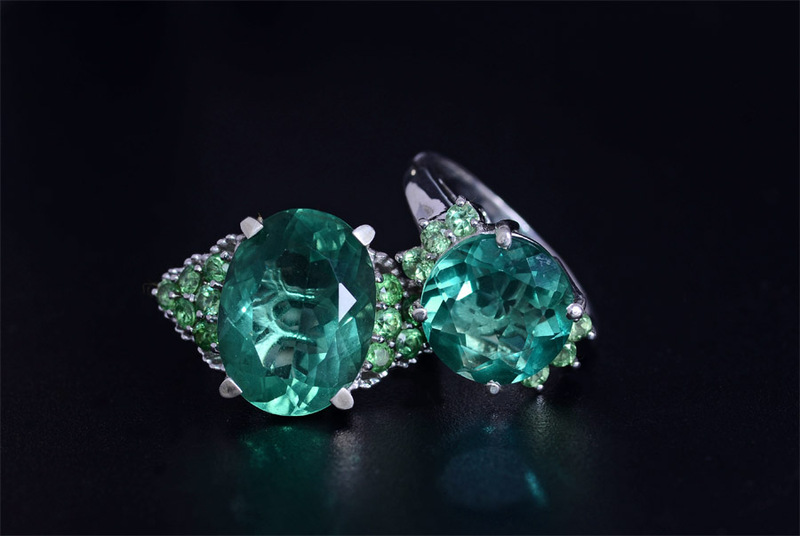 However, emerald favors bluish tinges in their green coloration, making the gems appear serene and regal, whereas the mint green fluorite favors subtle splashes of blue, making the gem appear a bit more lively and energetic. In general, mint green fluorite is bridging the gap between emerald and aquamarine. It occupies the middle ground between the two popular gems, providing a wonderful balance of cool and warm color. Anyone who loves green emerald, aquamarine or other green gems will appreciate the captivating glow of mint green fluorite. Where Does Mint Green Fluorite Come From? Shop LC sources its mint green fluorite from Quebec, Canada which produces some of the best quality mint green fluorite in the world. Other locations where gem-quality fluorite is found include Argentina, Austria, China, England, France, Germany, Mexico, Morocco, Myanmar, Namibia, Russia, Spain, Switzerland, and the United States. How is Mint Green Fluorite Mined? Fluorite is usually deposited in veins by hydrothermal processes, in sedimentary deposits around hot springs. In these rocks, it often occurs as a gangue mineral associated with metallic ores. The gemstone is also found in the fractures and cavities of some limestone and dolomites. Fluorite rich veins may be weathered to depths of as much as 75 meters. In this case, fluorite is mined in open pits with draglines, scrapers, or power shovels to depths of as much as 50 meters. Below that, underground mining methods, involving modified top slicing or overhead shrinkage stopping, are used. What Does Mint Green Fluorite Mean? Many therapists believe fluorite as a stone that awakens suppressed feelings and combat narrow-mindedness. It is said to remove pain when placed directly on the affected area. The stone is particularly helpful for ailments such as energy blockage, respiratory problems and suppurating wounds and skin diseases as well as arthritis. Fluorite can also be used to ease joint problems and stiffness. Mint green fluorite is believed to bring relief from asthma and regenerate lung tissue. Furthermore, the gemstone clears negative energy and brings cleansing, renewal, and a spring-like freshness to the chakras. According to folklore, it is the home of rainbows. Ancient Egyptians carved scarabs and statues from fluorite. Is Mint Green Fluorite a Birthstone? Mint green fluorite is not recognized as a modern birthstone. 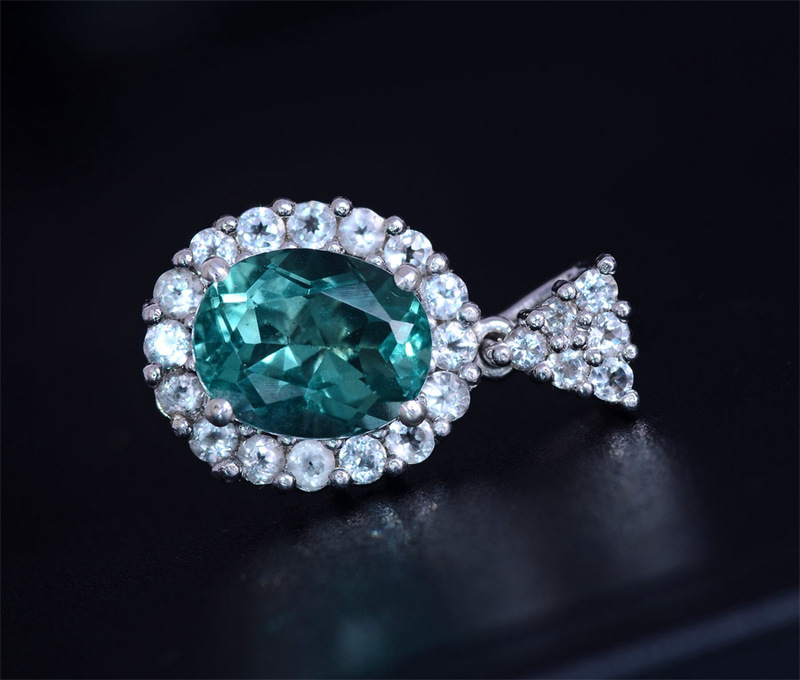 However, the resemblance of the gemstone to emerald makes it a viable substitute for the modern May birthstone. Mint Green Fluorite ranks four on the Mohs scale of hardness. Mint Green Fluorite displays bottle green color. Shop LC sources our supply of mint green fluorite from Quebec, Canada. Mint green fluorite does not undergo any treatment. Fluorite may also be known as fluorspar.